The Cat on My Head’s Mau has his Sunday Selfie photobombed by Cooper. I tried to convince Cooper Murphy to remove himself from my blanket, which was a gift from Allie, as well as my side before I snapped my selfie. As you can see, I was not successful. And that’s the explanation for my expression. I’ve got absolutely nothing else to say today, which in itself is probably a first for me. So here’s that hopping stuff Mom makes us post every week. So our art for Athena’s Caturday Art Blog Hop is the paw of one of the Kitties Blue. I said I would have a surprise for the human and anipal who correctly guessed to which cat the paw belongs. Well, we only had a pawful of visitors yesterday, and no one guessed correctly. If you want to pop back to yesterday’s post, the link is at the bottom of this post. If no one figures out who belongs to that paw, I’ll have a random drawing for a prize. We’ll let you know the winner tomorrow. You look sweet, Mau, even when you scowl! Aww, we missed out onthe paw guessing game…we thought Calista Jo, but of course that was wrong too,MOL! I was originally a cat who didn’t like cats. I was very afraid of animals, so it was hard for me to touch them, even though they were beautiful, lovely. I cannot overcome the obsession to love animals. 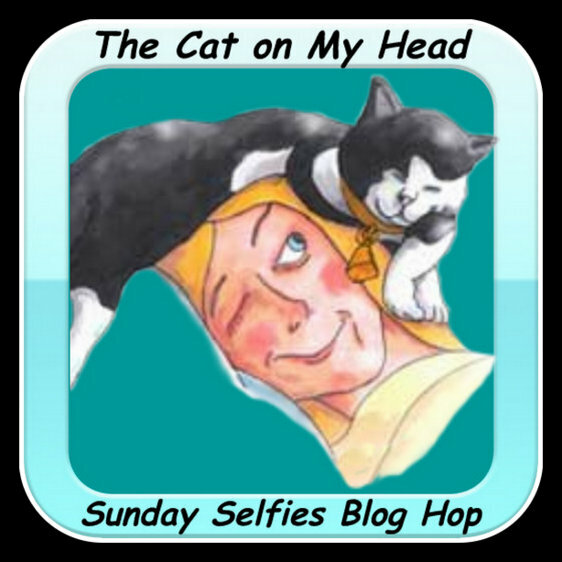 Spitty the Kitty recently posted…Sunday Selfie: She’s Right Behind Me, Isn’t She? We’ll just consider it a selfie double, or an usie this time! No…we have not fallen off the planet…Mom has NOT been helping us post. Yes, we get photobombs here too! I guess Cooper Murphy didn’t want to be left out! You do have an annoyed look on your face. I see it here all the time when Chris intrudes on someone’s space. Mew mew mew Mauricio you look hansum an a bit miffed! Cooper Murphy cuud not reesist yore mew blanket mee thinkss! Allie will love yore selfie; no wurriess there. Pee S: Thanx Aunty Janet for link upss…. Siblings are so frustrating sometimes! Great Selfie, Mau! As the World Purrs recently posted…Mama Mia’s Babies – 6 weeks old! As we said before you look Grumpy, but even if Cooper Murphy wouldn’t listen to you it made a nice selfie. Y’all so look cute together, photo bomb or not! Have a great week! Mau, you don’t look very happy there sharing the blanket. And it doesn’t look like Cooper Murphy plans to move anytime soon. That blankie does look super comfy and that’s a terrific selfie! Yes, you do not look very happy having to share your blanket! You are such a good big brother! I love you so much!! I had another guess on your other post. That is still a sweet selfie even though you have to share your blanket with Cooper Murphy. Well at least he let YOU be the star – the back of Coop’s head isn’t nearly as “selfie-worthy” as the FRONT of your head Mau! Yes the look does rather say all that needs, MOL. Still a sort of two for one deal this week—but you still look very charming. Purrs for a good week. Meowser, my selfie was sort of boomed by my chicks, but I was so busy watching over them that I didn’t realize until you mentioned Cooper Murphy. 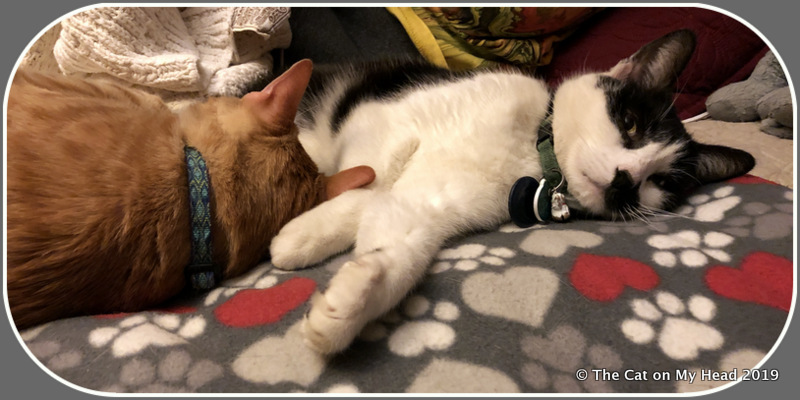 Thank you for taking the time to host this blog hop, purrticularly when you were so busy purrtecting your blankie! Miss Janet I am guessing Lisbeth but I could be way off base. Sending my best to you all and to young Sawyer. PS We hope you have your copyright sorted. We wonder whose paw that is? We must’ve guessed wring. MOL!